← Annual Membership Meeting of the Hudson Valley Research Lab, Inc. will be held Friday, March 16th at 8:30am at the HVRL, 3357 US Highway 9W, Highland, NY 12528. Overwintering Pear Psylla Adult on Bartlett Stem. Recent snow in late March provided a welcome delay in bud maturity. With temperatures now moving into the mid to upper 50’s by Friday, the pear psylla adult will be increasingly active throughout the Hudson Valley as we move through the pre-bloom period. Egg Hunt: As of this morning (26th March) bud counts for psylla eggs have not found fresh eggs. As Oviposition begins and build over the coming week, management to inhibit intensive egg laying should begin. Considerations for management in southern blocks and orchards along the Hudson River provide a timely window as dry weather and orchard access permits. Cooler night temps and rain are expected later in the week with mild temps and dryer conditions forecast over the weekend. In the overwintering stage, the adult lingers about the orchard and woodland edge from fall, through the winter into spring. Adults are often seen in flight during the warm hours of the day, with increasing movement of woodland adults into the orchard over the next few weeks. After mating, females begin to produce eggs for the first of three to four generations beginning with nymph hatch from late March through June. 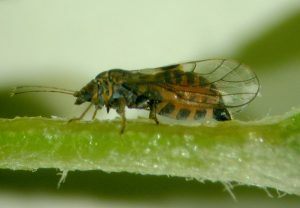 Early Season Strategies: To begin management of pear psylla consider including pre-bloom applications of ovipositional deterrents, ovicides and insecticides aimed at deterring egg laying, adult and nymph populations. Early management should begin upon the first signs of the egg. To delay the insect from laying eggs, Surround WP or oil at 1-3%, based on temperature and green tissue present at time on both sides of the application, can be used, as both act as a barrier film to reduce egg laying. Delaying oviposition of the adults buys time for a greater number of over wintering psylla to enter the orchard from the hedgerows and woodland for a later adulticide application. It also allows for the compliment of eggs being deposited to be delayed, thus synchronizing the emergence of the psylla nymphs for a directed application targeting this life stage. In 2016 the use of two applications of oil, at 1 and 2%, were made on the 15th of March and 1st of June to demonstrate the effectiveness of these applications on reducing egg and nymph presence over the early part of the season. The resulting summary collected from this trial is shown below. From this study we see a dramatic reduction in both nymphs and eggs using two applications of 1% and 2% oil. The use of Surround WP at 50#/A, used exclusively during the pre-bloom stage has provided excellent reduction of the 1st generation nymphs through reduced egg laying management with no observed clay residue on fruit at harvest. We often think a single application of oil and a pyrethroid will ‘do the job’ during the pre-bloom period. This data suggests that the use of oil alone showed significant difference in reduced eggs on the tree and reduction in emerging nymphs in 2016. As the adults reside both in the orchard and also migrate into the pear blocks, it would be wise to delay insecticide until migration of adults is complete and to consider the use of oil in two applications followed by a targeted adult insecticide as we move toward bloom. Pyrethroids are known to have reduced efficacy when used during warm temperatures above 65oF. On a cautionary note, we have seen in field studies most pyrethroids completely fall down in psylla management, likely due to the insects’ ability to detoxify this class of insecticides as temperatures increase. Cool weather provides conditions to optimize the use of pyrethroids. However, the use of these insecticides over the past 20 years has decreased pear psylla susceptibility to the pyrethroids such as Asana (esfenvalerate) and Warrior (Lambda-cyhalothrin). Their use should be limited and used only during periods of cool temperatures. Bee Wise: As pear bloom earlier then apple pollinators tend to move to pear well before their shift over to apple. With this in mind, we know that the pyrethroid class can act as an insect repellent. Given that the honeybee is not particularly fond of pear flowers relative to other tree fruit blossoms, considerations should be made to optimize bee attractiveness to pear blossoms during pollination. 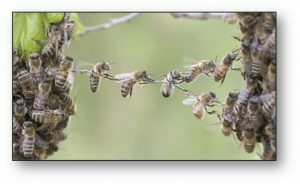 To best achieve pollination it might be best to restrain from using pyrethroids during the period from white bud to bloom so as to reduce bee repellency. Pear Management Options: The advantages of using oil to control this insect are many. Oil is still a relatively inexpensive material for which there has been no mechanism for resistance development by the insect. It provides a degree of egg laying deterrence to treated buds and wood lasting a week or two depending on rates and weathering. Higher rates would be applied at the dormant stage this week, using one spray of 3% oil, or two of 2% to green cluster. This rate will also reduce overwintering populations of San Jose scale, European red mite, pear leaf blister mite, and Comstock mealybug. If you begin at swollen bud, one spray at 2% or two at 1% up to white bud would suffice. Contact of the adult by oil droplets will cause mortality while applications over top of the egg will reduce adhesion, often causing them to dislodge from the tree. Oil applied prior to oviposition acts to delay and synchronize egg laying later into the season, producing subsequent emergence of the nymphs for a concentrated management approach using a single insecticide application. Negative observable impact of oil applications has been shown to cause enlarged lentilcels on developing stems which may have impact of plant respiration. Using an ovipositional deterrent (oil, Surround WP) is a prerequisite to at least two follow-up strategies. One option, upon completed migration of the adults into pear orchards, the use of an adulticide is made to kill the adults, before significant eggs have been laid. Adulticides would be employed this season from mid to late April to significantly reduce the adult population. The choices for managing adult psylla include the neonicotinoids Actara 25WDG at 5.5 oz/A and Assail 30SG at 4–8 oz/A; and the pyrethroids, Ambush 25WP and Pounce 25WP at 12.8–25.6 oz/A; Asana XL 0.66EC at 7.3-12.8 fl oz/100 gal.or 9.6-19.2 fl.oz/A (from dormant to white bud stage; postbloom rates are lower); Proaxis 0.5CS at 2.6–5.1 fl oz/A; Danitol at 16-21.3 fl oz/A; or Warrior II at 1.26-2.56 fl oz/A. Multiple applications may be needed in order to achieve optimum early season control. The economicsin management is a driver in decision-making for pear production. Surround WP is most effective at the highest labeled rate of 50 lbs. / A (roughly $1.00 per pound) costing about $50.00 / A. Two to three applications during the pre-bloom and petal fall period have shown to be a viable approach to early psylla management. Although it does not kill the adult, it will inhibit egg laying as long as there is sufficient material on the foliage and stem to keep adults from the tree. The use of a single prebloom application at 50 lb./A Surround was comparable to a single 2% application of Damoil in reducing oviposition when applied at the same time. Yet as the season progressed, the Surround treatment performed better in reducing the nymph presence on foliage during later assessments compared to other pre-bloom choices. The stratification or layering of the kaolin clay, the active ingredient of Surround, builds on the limbs to maintain the product on the tree. Using early season applications through to petal fall have additional benefit of controlling plum curculio along with reducing egg laying from the 1st generation of psylla adults. Surround has not been shown to be toxic to the insect and as such, is an important tool for use in resistant management strategies for this insect. The additional information on this topic review the 2012 Scaffolds article addressing early Surround WP followed by 1% oil strategy. Ending the use of Surround WP at Petal Fall will minimize the overall cost of management using this product while reducing the potential for clay residue depositing on the fruit at harvest. However, pear will require the continued use of management of pear psylla throughout the remainder of the season. We have found the use of 1% oil at a two-week interval to provide sufficient control of the nymph population by reducing both egg laying and nymph survival. See 2015 RESULTS OF INSECTICIDE AND ACARICIDE STUDIES IN EASTERN NEW YORK; Hudson Valley Laboratory, Highland, NY pgs 24-30.